PETALING JAYA: Research analysts are divided on whether investors should cash out on Permodalan Nasional Bhd's (PNB) offer to acquire property developer SP Setia Bhd's shares at RM3.90 per share and 91 sen per warrant. Some analysts advised investors to accept the offer, which represents a premium of 11.4% for the ordinary shares and 97.8% for the warrants compared with the closing prices on Tuesday, while others said investors should adopt a “wait and see” attitude in view of the possibility of a higher offer price or counter-bid situation. 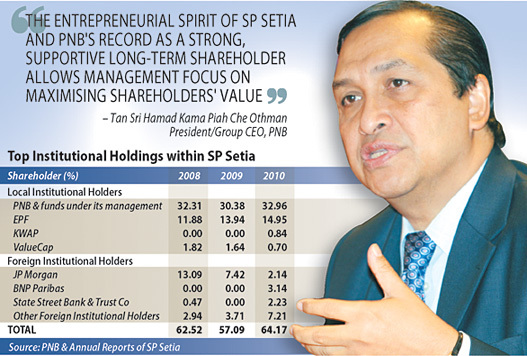 For several years PNB, together with its units, has been SP Setia's largest single shareholder with just under a 33% stake, the trigger point under the takeover code. It passed the trigger point on Tuesday with additional market purchases. Other major shareholders of SP Setia include the Employees Provident Fund with 13.4%, and SP Setia president and CEO Tan Sri Liew Kee Sin with 11.26%. Analysts from ECM Libra Investment Research and OSK Research advised investors to accept the PNB offer. ECM Libra Investment research head Bernard Ching said in a note that the offer was viewed as fair and attractive since it valued SP Setia at up-cycle valuations when the current market condition is on a downtrend. Ching pointed out that the property sector might enter a cyclical downturn due to a weakening economic outlook, deteriorating housing affordability and policy risks. OSK Research also opined that PNB's offer price was a decent exit strategy for investors. “The offer of RM3.90 per share translates to 2.25x FY12 (financial year 2012) price-to-book-value which is slightly above SP Setia's five-year historical average price-to-book-value of 2.22x. The offer price also translates to 23.1x price-to-earnings ratio (PER) on FY12 earnings per share which was above the consensus FY12 PER of 18.04x as well as above SP Setia's five-year historical PER of 19.28x,” said OSK Research. However, Hong Leong Investment Bank analyst Sean Lim said long-term investors who believe in the intrinsic value of SP Setia should not accept the offer. “We agree with SP Setia's board that the offer price significantly undervalues the company as it is at 15% discount to our RNAV estimate of RM4.58, and appears unattractive versus the street's target price range of RM4.12 to RM5.41,” said Lim. Lim added that there was a good chance of a better offer price materialising for SP Setia. HwangDBS Vickers Research analyst Yee Mei Hui said PNB's offer was taking advantage of current weak market sentiments as it valued SP Setia at a 24% discount to RNAV of RM5.11. A major concern was whether Liew and his management team would remain in the event of a successful takeover bid by PNB. Kenanga Research said the company's fundamental value and branding would diminish considerably if SP Setia's current leadership and team exit. “The key selling point of SP Setia has always been its management team and ability to turn around non-prime landbank into flourishing property development,” said Kenanga Research. CIMB Research said the best-case scenario was for Liew to continue to run the company and PNB to go into joint ventures or inject property landbank into SP Setia at arm's length prices. CIMB Research added that the worst-case scenario was Liew selling his entire stake. SP Setia's shares and warrants were among the top gainers and most actively traded yesterday. Its share price closed 37 sen higher to RM3.87 while SP Setia-CC was up 6 sen to 7.5 sen, SP Setia-CD rose 5 sen to 7 sen and SP Setia-WB jumped 33 sen to 79 sen.
KUALA LUMPUR: PermodalanNasional Bhd (PNB) wants to work with the current management of property developer SP Setia Bhd, andcontinue to deliver value to shareholders. In a statement, PNB said it hadconfidence in SP Setia's existingmanagement team and reiterated that, as stated in the notice of takeover, it had every intention of retaining the listed status of the company. “This is a synergistic collaboration that blends the entrepreneurial spirit of SP Setia and PNB's record as a strong and supportive long-term shareholder, which allows the management to have an undivided focus on maximising shareholders' value,” said PNB president and group chief executive Tan Sri Hamad Kama Piah Che Othman. On Wednesday, PNB offered to acquire SP Setia shares at RM3.90 each and 91 sen per warrant. The takeover bid by PNB caught the SP Setia board unawares and spread concern through its senior management. The SP Setia board had responded by saying it was seeking competitive bids because the PNB offer undervalued the company based on external valuations by investment analysts published before the receipt of the offer. The SP Setia board would also ask PNB to revise its offer upwards. However, Hamad Kama Piah said the offer price of RM3.90 per share was fair and reasonable. “We have considered this offer from various angles, such as market conditions amid the interest of all stakeholders especially minority shareholders. The statement pointed out that SP Setia fitted into PNB's investment criteria as the group was continuously looking for well-run and fundamentally strong companies, given the substantial funds under its management. Hamad added that the offer was in line with PNB's long-term strategy of enhancing its investments in the property sector. 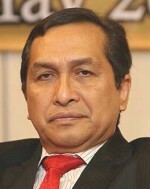 “We are confident of the prospects of the sector in Malaysia. Having a strategic holding in SP Setia would further strengthen our portfolio, which already has a strong presence in the banking, plantation and automotive sectors, among others,” he said. PETALING JAYA: Axis REIT Managers Bhd's recent acquisition of real estate in Seberang Prai will give it a gross yield of 11% and a net yield of 10.2%, said chief executive officer and executive director Stewart LaBrooy. He said while Axis gearing levels would rise to 39% after this deal, they would come down to 26% by year-end when the company's proposed placement of 75.1 million units was completed. This will help the company raise RM180mil. “We are bullish about Penang now and will be making more investments in the north,” he said, noting that the rapid industrial development in Penang was a draw for the REIT. Axis is paying RM59mil for a logistics industrial building facility built on two parcels of adjoining industrial land in Bukit Tengah Industrial Park. They have leasehold titles that expire in 2052 and 2068. LaBrooy said the purchase price of RM59mil was a net gain as the total market value of the property was RM62mil according to independent valuer CB Richard Ellis. For the facility, the REIT will inherit the tenancy of Schenker Logistics (M) Sdn Bhd, a global logistics service provider. The tenancy which expires in mid-2014, will generate RM573,076 in monthly rentals or RM6.88mil in gross annual income. The 408,250-sq-ft property is the fourth investment in the north and the 28th property secured by Axis which invests mainly in Penang, the Klang Valley and Johor. It will increase the REIT's asset under management to over RM1.33bil. Analysts have said the acquisition is no surprise because the company has aimed to increase its total investment properties to RM1.5bil by year-end from its current RM1.25bil. On its stock price, an analyst from RHB Research said that Axis was doing better than other REITs. “We are still positive on the stock. Even near 40%, its gearing ratio is still considered manageable and the company will pare down its debt with the planned placement,” he said. He added that while the market had been affected by the recent economic turmoil, Axis had been “fairly resilient and its valuation was still supported by strong yields, which have historically remained between 7% and 10%”. Axis shares closed at RM2.35 yesterday, 1 sen lower from Wednesday. HwangDBS Vickers Research said that if Axis completed its acquisition by October, it would enjoy a RM1.7mil gross revenue this financial year (FY11) and RM6.9mil in FY12 from the property. 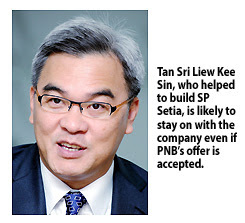 KUALA LUMPUR: Tan Sri Liew Kee Sin will be a major force in deciding whether or not SP Setia Bhd accepts the offer made by Permodalan Nasional Bhd (PNB), analysts said. And the view is Liew, who helped to build SP Setia, is likely to stay on with the company even if PNB's offer is accepted. "His (Liew's) decision will sway whether other investors will take up the offer," Jupiter Securities head of research Pong Teng Siew said. On Wednesday, PNB offered to gain control of the property company for RM3.90 a share and 91 sen per warrant. It also wants to keep SP Setia listed. But this was rejected by SP Setia's board on the same day, saying the offer "fundamentally undervalues" the property developer and that it will seek rival bidders. As the one who built the company, it is unlikely that Liew will leave SP Setia, because of sentimental reasons and the fact that no one wants him to leave. "Since PNB wants to maintain SP Setia's listing status, Liew's stake is also protected, compared to if the company was not listed. This is his business," another analyst said. Last night, PNB expressed its confidence in the existing management team and its intention to continue to work with them to deliver value to shareholders. PNB now has 33.17 per cent of SP Setia, Liew holds another 11.26 per cent and SP Setia's foreign shareholding is some 21 per cent. Meanwhile, Pong opined that it was unlikely that a management buyout could happen. "Given the sheer size of the company, I doubt that there is anyone who can outdo the offer," Pong said. It is unclear why ECM Libra Financial Group, which first became a substantial shareholder in April, wants to have representatives on the board. Kuala Lumpur: What happens at Eastern & Oriental Bhd (E&O)'s annual general meeting today is likely to show investors where major shareholders stand on a surprise request to add new directors to the board. ECM Libra Financial Group Bhd, an investment bank with 6.42 per cent of E&O, has nominated lawyers Mahadzir Azizan and Leong Kam Weng to be directors of the property firm. It is unclear why ECM, which first became a substantial shareholder in April, wants to have representatives on the board. It is also thought that authorities are not keen on investment banks to have property businesses, which is one reason why others like OSK Holdings Bhd have split that business away while TA Enterprise Bhd have not pursued investment banking to keep its property operations, analysts said. ECM's nominations also comes after Sime Darby Bhd has completed buying 30 per cent of E&O for RM2.30 a share, a big premium to the market price. The sellers were E&O managing director Datuk Terry Tham Ka Hon, GK Goh Holdings Ltd and Tan Sri Wan Azmi Wan Hamzah. Minority shareholders are reportedly unhappy a general offer was not extended to all. Sime Darby has defended the deal, saying it may do so in the future. That deal as well as other stock purchases by company insiders before Sime Darby's entry are now being investigated by the Securities Commission. "After 17 days, minority shareholders still don't know what the outcome of the investigation by the SC is, and why it is taking so long for the investigation to complete," said an analyst, who expects minorities to be very vocal at the AGM. At the meeting, four directors of E&O are seeking re-election. They are Tham, Datuk Azizan Abd Rahman, Vijeyaratnam V. Thamotharam Pillay and Datuk Henry Chin Poy Wu. 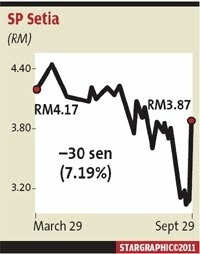 E&O shares rose six sen to close at RM1.49 yesterday. HONG KONG: Singapore-based shopping mall developer CapitaMalls Asia said on Friday its secondary listing in Hong Kong would begin trade on Oct 18. No new shares will be issued as a result of the Hong Kong listing, it said in a filing to the Hong Kong bourse. The company, a unit of property developer CapitaLand, first said in March it would seek the secondary listing to bolster its expansion plans in China.